Over 40 Amateur Of The Week: Pumped Up Pam! Pam bucked mainstream trends to become a chiseled bodybuilder at age 46. See what struggles she overcame to accomplish her dreams and dominate women's bodybuilding! I was tired of making excuses for being fat. I let injures keep me out of the gym and they became my excuse to eat unhealthy when I couldn't work out. My logic was that I should enjoy food I normally didn't eat. Looking back, I can't believe I convinced myself to live that way. I was uncomfortable and everyday tasks became burdens. It was incredibly embarrassing to have succeeded in bodybuilding competitions back in 2001-03 and then become morbidly obese. I couldn't explain that to people who knew and supported me during my athletic years. It caused me to spiral into depression, which fed my desire to eat more. I spiraled out of control and blamed everything but myself. I was concerned because my teenage daughter was developing bad eating habits too and I didn't want to be a bad example. I didn't want her to experience the same eating issues I battled since puberty. So I decided to eat healthy over time and make small changes that weren't drastic. Because I had many past injuries from pushing too hard too fast, I decided to take a conservative approach. I split up the muscle groups to engage them three times in a two-week period and used hoist machines and cables for most exercises. I increased weight and decreased reps for every set until the last one, when I dropped the weight back down and increased the reps (example: 12, 10, 8, 6, and 12 reps). After 4-6 weeks on this plan, I continued on the same workout split, but did 100 reps for each exercise no matter how many sets it took. I did this for 1-2 weeks and went back to the original workout plan. Because I had lots of body fat to lose, I did cardio exercise daily; building up from 30-60 minutes per day, and I did at least three 30-minute HIIT sessions per week. My cardio exercise options were the stepmill, treadmill, and stationary bike. The stepmill was my primary machine because it provided the best workout. Bodybuilding.com articles taught me to feed my body nutritious sources of protein and carbs, and to eat six meals per day. Based on how much fat I wanted to lose, I reduced my carbohydrate intake during various meals throughout the week. I learned how my body responds to various foods. I had a fascination with women bodybuilders from the 1980s and 1990s. I poured through muscle magazines in the early 1990s and thought I could compete. I never believed I could do it until I read Body for Life in 2000. I lost 100 pounds and competed in amateur bodybuilding after a year and a half of training. I set out to win the Colorado State Title, trained for three years, and won the Colorado State Bodybuilding Championship—a dream come true! But I wasn't able to maintain my physique. An excruciating back injury kept me out of the gym, plus I had to cope with my husband's disability needs. He had a brain tumor many years ago that required surgery to save his life. The repercussions from the surgery left him with speech and walking impairments. I used the excuses to avoid exercise and eat poorly. My weight ballooned to 255 pounds on my 5-foot-6 frame. It shames me to admit, but I considered a gastric bypass. I fixed my back problem, gradually returned to the gym, and reduced my food intake to lose 50 pounds in two years. I modified my lifestyle permanently because I didn't rush it. I was on Bodybuilding.com one day and saw the 100K Dymatize Challenge, which upped my game and forced me to work harder in the gym and eat with more discipline. I finished the challenge and was proud of my accomplishment. A bodybuilding friend mentioned an upcoming natural bodybuilding show that started three weeks after final photos. I decided to make a comeback and compete 10 years after my last Colorado State victory and won the title again. In the past, I tried to lose weight to look better for my husband or to surprise my parents, but I finally did it for me. People like Cory Everson and Monica Brant portrayed the type of physique I could potentially have, but ultimately it was up to me to change. 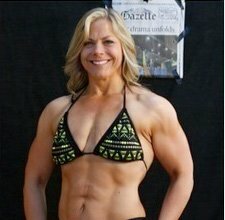 I poured through the transformation pictures on Bodybuilding.com and other sites. The normal everyday people inspired me to change. I didn't see pictures of someone like me, a female, who had lots of body fat to lose and wanted to become a bodybuilder. Throughout my transformation, I used different BodyGroups and BodySpace to communicate with like-minded people. I'm currently training for the INBA Team USA on September 28, 2013, in Las Vegas. My goal is to come into the competition leaner than my last competition and qualify for the Natural Olympia on November 9, 2013, in San Diego. I trained hard to put on more muscle and am beginning the process to get lean for this competition. I still post messages on BodyGroups and BodySpace to lend advice when needed. Do what works for you and be consistent. The best way to make long-term changes is to use a long-term strategy that involves consistency and lifetime sustainability. When I tried to get fit too fast, I regained the fat and lost motivation. This time I made changes to fit my lifestyle with short-term goals for bodybuilding competitions. My favorite bodybuilder is Toni West. She's a mother who had a c-section, gained pregnancy weight, and still attained an amazing physique. In my opinion, her natural physique is the best. Bodybuilding.com connected me with like-minded fitness individuals and provided me with expert training and nutrition information. I order my supplements from Bodybuilding.com because it's easy, efficient, and cheap! To my BodySpace friends. I couldn't have stuck with it to make these changes without you. To Jill Kolivoski for believing in me when I didn't and for being the best-long term friend. To Christine McCurley who endured this journey with me. I'm honored to call her my friend. To Nigel and Tammy Peck who helped me with photos and new ideas for future photo shoots. To 24-Hour Fitness staff and members who put up with my crankiness every day. To my coworkers who endured my weightlifting stories and complaints about sore muscles. To KOAA, local Colorado Springs TV station, for making a news story about my journey. To Denny and Diana Kakos of INBA for bringing natural bodybuilding to Colorado. To my family who put up with my obsession to work out and plan meals no matter what.